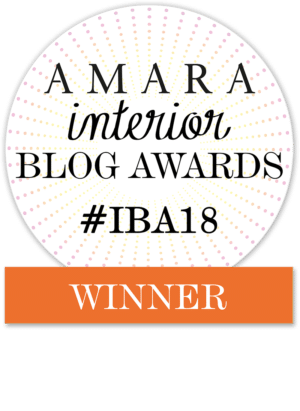 Since starting this blog, as well as being featured on many great sites I have had many of my projects featured in printed magazines and have even been interviewed for one. How cool is that! I want to keep these magazines easy to hand so I can show off my “fame” when friends and relatives visit. So I made myself a trendy DIY magazine rack for the living room. 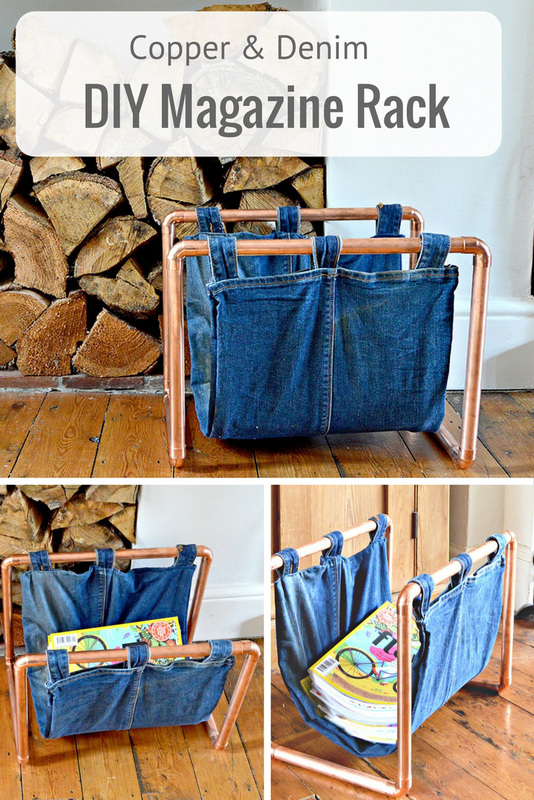 Copper is on trend at the moment and I love upcycling old jeans. Therefore I decided to use both these materials to make an awesome DIY magazine rack. Being a bit of a magazine junkie, this rack is a really stylish way to store my magazines. Personally I think copper and denim just go together so well. I had a stash of old jeans that I hoard for upcycling projects and my friendly local builder gave me some copper piping scraps. I bought any extra bits of copper piping I needed from the DIY/Homestore. 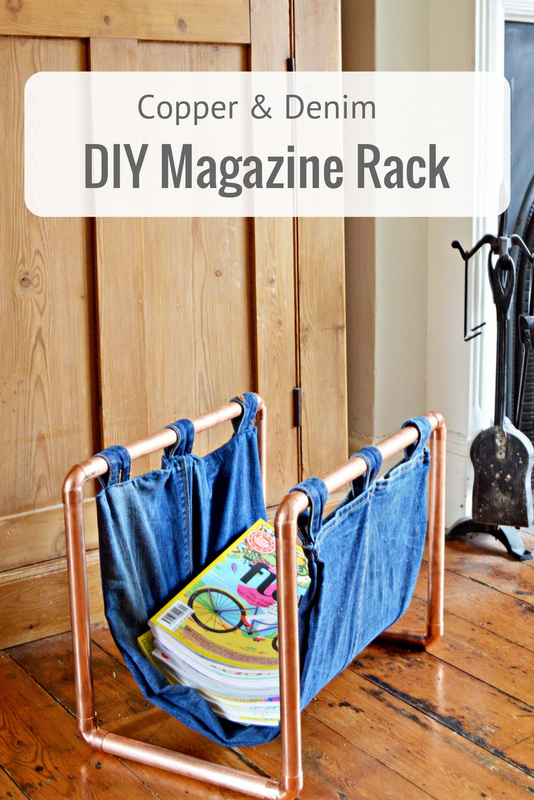 What you need to make a DIY magazine rack. Lacquer (if you don’t want the copper to tarnish). 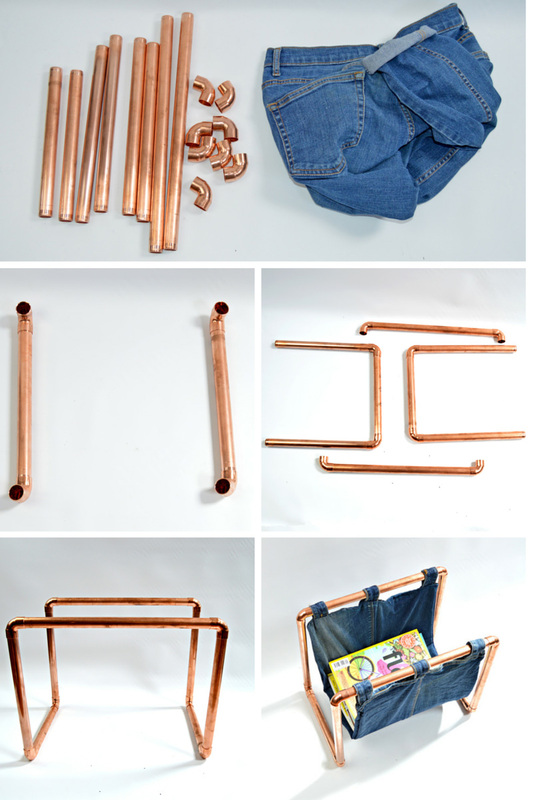 Firstly, cut the copper piping into 8 lengths 2x 25cm, 4x 30cm & 2x40cm. You can use a pipe slicer or hacksaw to cut your pipe. Then you attach the 4 remaining elbow joints to the top of your U’s perpendicular to the elbow joints at the bottom. 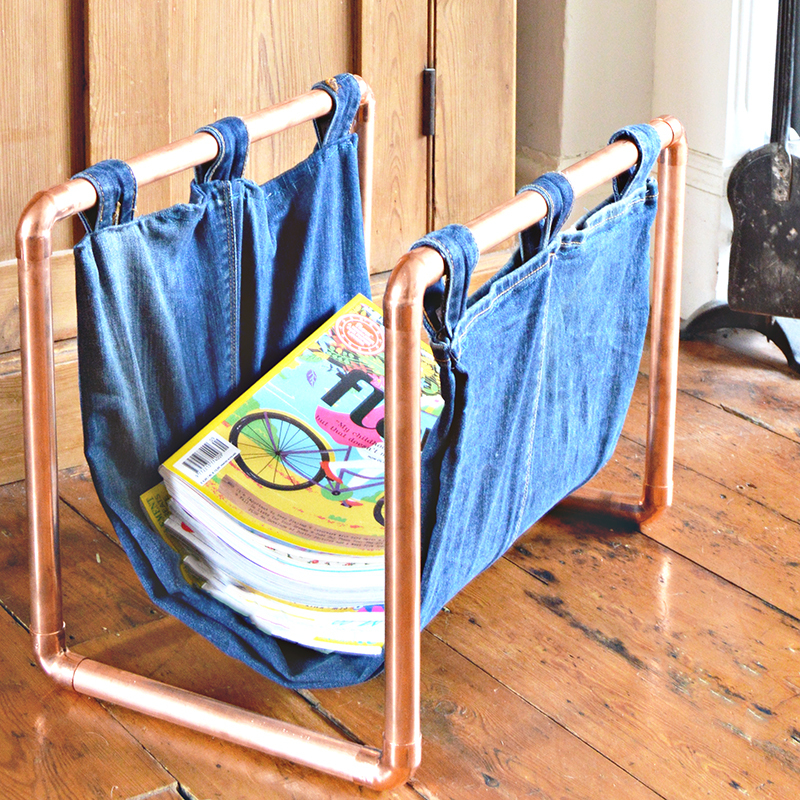 The Magazine rack is finished off by attaching the 2 U’s with the longer 40cm copper pipe. However, don’t do this until you have made your denim sling as the pipe needs to be threaded through this. Confused ? Don’t worry the picture below shows the pipe construction much better than I can explain it. Carefully cut the waistband off the jeans, then cut both legs off at the top. Unpick the outer seam of each leg. 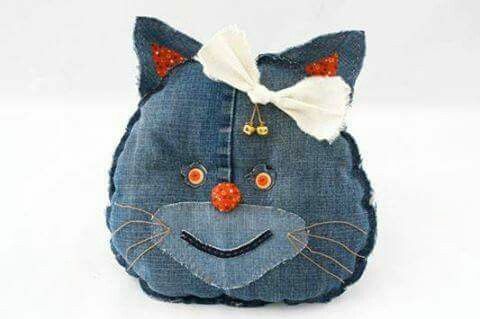 You should now have two large pieces of denim, trim these until they are approximately 68cm X 38 cm (give or take a couple of centimeters is ok). Pin these 2 large pieces right sides together. Sew down the long edge leaving a 1cm seam edge. This is your sling, which is now a tube, one end should have a nice seam from the hem of the jeans. The other end will be where you cut the jeans. Neaten this up by tucking over the rough edge and sewing a seam of approx 1cm while keeping the tube open. To make the loops at the top of the sling, cut six strips approximately 16cm in length from the waist band. Fold 3 of these waistband strips in half to form a loop. Pin together the top of the denim tube sandwiching the loops in between. One at each end and one in the middle. Sew the top of the tube together with these sandwiched loops. Note your sewing machine may struggle with the extra thickness when sewing over the loops, you can just do these by hand if necessary. Repeat step 6 with the bottom of the denim tube. Your sling is now ready. Thread your denim sling through the top copper piping lengths and then glue to the elbow joints of each U. 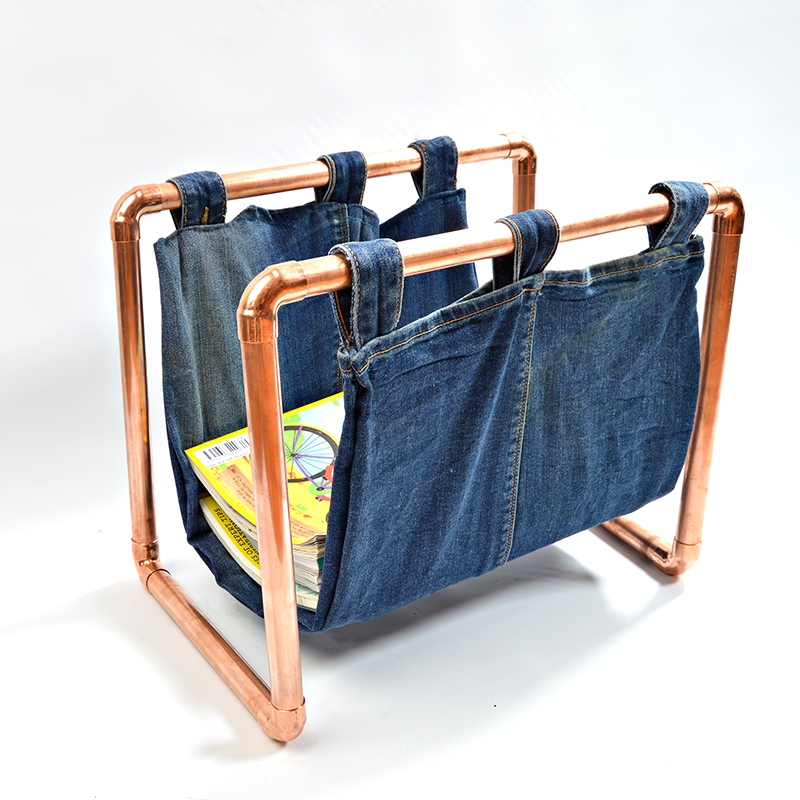 Your stylish magazine rack is now complete and ready to go. I used 22mm copper piping but you can use bigger or smaller piping depending on your taste or what scraps you get from your plumber as long as all the bits used are the same diameter. The copper pipe will tarnish over time if you don’t want this to happen you can lacquer your frame. 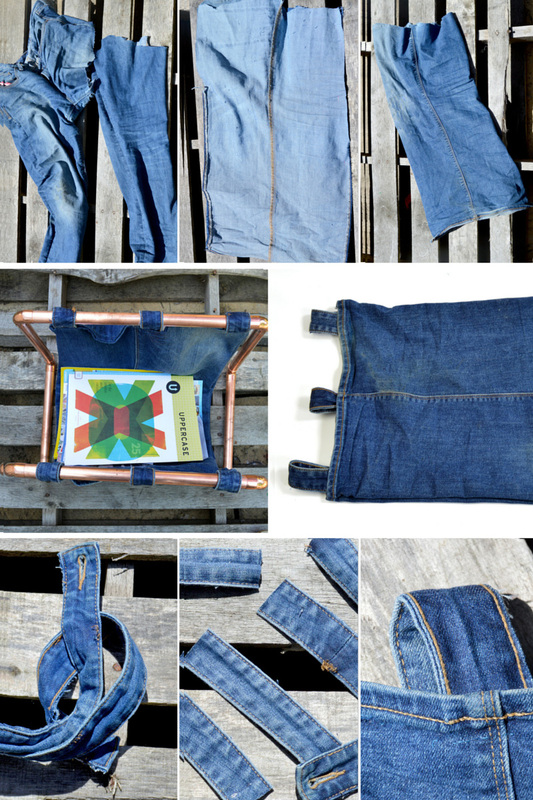 You don’t have to use an old pair of jeans to make your sling, you can use any strong fabric you like. To be really on trend you could print your own canvas fabric with cactus and use that to make the magazine rack sling. For more great DIY storage ideas check out the DIYideacenter. This is such a wonderful project. I love copper! I have some old copper and was wondering what to do with it. Thank you, Maria. Denim and copper really go well together so maybe see if you have some old jeans you can use. I think I’ll make this only it’ll be used for kindling for my wood stove. Thanks for sharing. That sounds like a great use for it. Some people have said they have used it as a cat bed! I love this, but I have a feeling that in my house, it d become a ferret hammock and the magazines would be pushed onto the floor. ?? Really nice though. I love the copper accents. Love the idea of a ferret hammock, should have made a mini one of these for my sons rats ! Thanks. Thank you ! I keep all my boys jeans waiting for the right projects as well. What a clever idea! Thanks for linking up at the Weekend Blog Hop at My Flagstaff Home! This looks amazing! What a great DIY. Loooove the copper and you always have a pair of old jeans lying around, don’t you?